In this space you will find downloadable PDFs of tools that can be very helpful as you strive to live the healthy life. The goal is to keep these tools as simple as possible. Contact us if you have questions about any of the tools or if you lack access to a printer and would prefer a mailed copy of any of the resources. 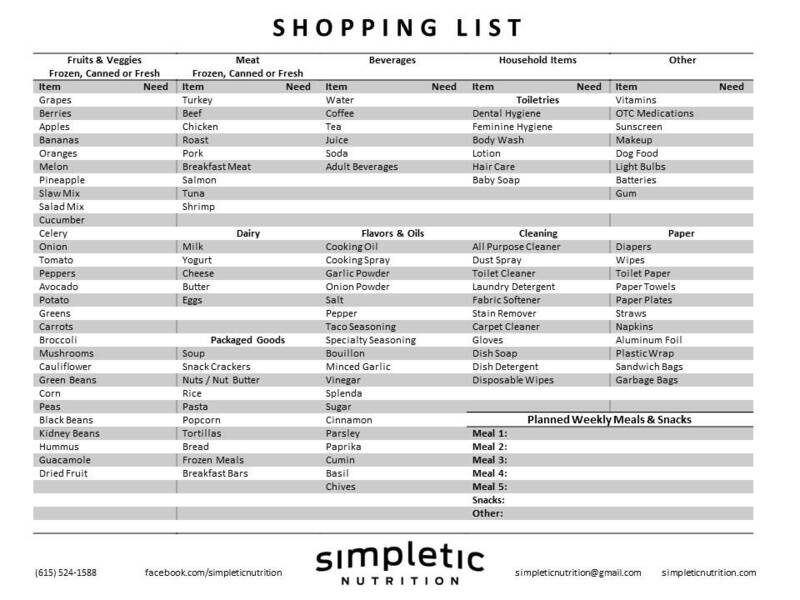 Use this shopping list to print and fill out every week before heading to the store. Besides the planning aspect, this list helps remember all of those things that are normally forgotten when you head to the store to avoid a mid-week trip or running out of important ingredients and ordering take-out. If you want to write out a sample weekly meal plan in a calendar format, you can use this tool to help you stay organized. It is nice to have 28 days planned in advance to refer back to from time to time to remind you of healthy meals that you enjoy making - it is surprisingly easy to forget what you normally like to have for a healthy dinner. Keep it close by in the kitchen cabinet, perhaps in a binder, so it's always there for you when you need inspiration.